There are some materials employed in engineering practice such are primarily meant to carry compressive loads, bricks, wood, and concrete are normally employed into compression. Consequently, the mechanical properties of those types of materials are in compression test frequently evaluated. Normally, behaviors in tension and compressive are same except there are differences in stress-strain demonstration and mode of failure particularly in ductile materials that need understanding. In an easy compression test cylindrical specimens of standard length to diameter ratios are compressed in between two platens beneath axial load. The mechanical properties as like: yield strength, elastic constant, modulus of toughness and also ultimate compressive strength, modulus of elasticity can be found for brittle materials in compression test. For a ductile material, though, the ultimate compressive strength cannot be explained as a ductile material remains on expanding in lateral directions like compressive load increases. Such lateral expansion maintains to take place whereby area raise and ultimately the specimen or test piece might be turned into disc following figure. Such lateral bulging of a ductile material enables this to resist almost indefinitely large focus with no having any fracture. The specimen or test piece in contact along with platen expands less since of friction among surfaces of specimen and platens. Occasionally the stress for an arbitrarily selected deformation is indicates like compressive strength of a ductile material. Frequently, the ability to undergo huge plastic deformation beneath compression is known as malleability of ductile materials except this property cannot be explains quantitatively. Elasticity's Modulus and resilience's modulus for ductile material can be estimated in compression like in tension but toughness's modulus cannot be explained. At atomic level, not as tensile stress case, no exact maximum exists in stress vs. atomic bond curve and hence there is unlimited to repulsive force that can be building up among atoms. Hence, the compression will not become the reasons of failure and will all time result in elastic strain. It is the shearing stress component that reasons the atomic plane's slip and conclude in bulging of the test piece, and plastic deformation. 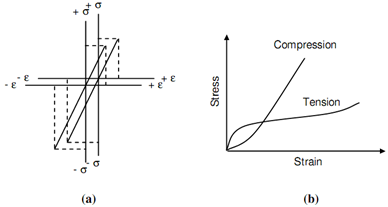 Along with this consideration the stress-strain diagram inside elastic limit will be the extension of such in tension along with the difference as the elastic behaviour in compression ends higher values of stress and strain as represented in following figure (a). Long chain polymeric materials as like rubber, wood or cork represent distinctly not same behaviour in compression and tension. In tension the coiled molecules are first not coiled and after that strained whereby those materials present low stiffness followed via higher stiffness in tension. Conversely compression may tend to reasons further coiling in the initial stage followed via elastic compression of molecules presenting slight stiffening effect in instantaneous decrease of stiffness. While the cells are compacted along with increasing compressive load, the stiffness will further raise.